A lot of Nigerians believe that eating eggs can make you fat, because they were told from “passed down” assumed knowledge that they contain a lot of cholesterol. However, that belief is ABSOLUTELY Wrong! You will soon see in this article that not only are eggs good for you to eat, but can help your body build fat burning muscles that will help you lose weight rapidly. To understand what I mean, let us look at the main nutritional content of the eggs that we eat daily. Eggs are VERY rich in protein and contain 100% fat soluble vitamins A, D, E and K, as well as caretonoids, luteins and zeaxanthin. In addition eggs contain calcium,iron, phosphorus, zinc, thiamin, folate, vitamin B6 and B12. I mentioned that some people refuse to accept that eggs are beneficial when it comes to weight loss because it contains cholesterol; however, cholesterol in itself is not a bad thing. You see, there are two types of Cholesterol. We have the “Good” Cholesterol, which is called HDL ( high density lipoprotein) And we also have what is called “bad” Cholesterol which is called LDL (low density lipoprotein). It has been shown that dietary cholesterol raises the ‘good’ HDL, while the sugar and omega-3 and -6 imbalances raises the bad LDL and triglycerides in the body. In Essence, What I Mean Is That…. When you eat eggs, the nutrients in it will help your body’s “good (HDL) cholesterol to increase, which can help your body fight off heart diseases. This means that, it’s 100% OK for you to eat eggs when trying to lose weight as it does NOT have any side effect whatsoever. So the next time you hear someone complain to you that “you will get fat by eating eggs”, then ask them where they got their theory from and which dietician or food scienctific research did they get that theory from. scratch their head when you put this question to them. Usually, 1-2 eggs should just be good enough, if you are on a weight loss diet and you are trying to shed off the fat from your body. An egg contains about 6.3g of protein which is about 13% or our recommended intake every day, it also contains just 70 calories. So basically, it is wise to eat two eggs a day, its best eaten hard boiled or baked. Eating eggs can boost your immune system, help to lower the risk of heart disease and also help your body build muscles that actually burn fat off. The high quality of protein in eggs has been found to keep people feeling full for longer, thus preventing unhealthy snacking and additional calories which causes weight gain. Is the Yellow Yolk Safe To Eat? Some people, when eating eggs leave out the yolk and eat only the albumin (white part). A lot of people believe that the “yolk” is bad for their health. What they don’t know is that, the yolk is ACTUALLY the most nutritious part of the egg as a whole. Next time you boil your egg, eat it whole and you will enjoy the benefit better. 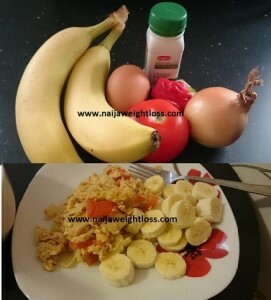 On your weight loss journey, you are allowed to prepare your egg cooked, poached, scrambled or even baked to eat. Whatever you do, DO NOT consume egg raw (uncooked) as a weight loss diet. If you do, you might be ingesting bacteria which may be present through the pores of the shell and this may cause food poisoning. STEP 2: Peel your banana and slice into a flat plate and keep separately. STEP 3: Cut your pepper and tomatoes into small slices/bits. Add the cut pepper and tomatoes to your cracked egg liquid and beat it with a spon. Put a little seasoning and pinch of salt. STEP 4: Put 1 tablespoon of olive/coconut oil in a heated pan on cooker/stove. Put the whisked egg into the heated pan and turn it regularly so it does not stick. Once done, turn down the heat and serve the egg with the sliced banana. NOTE: You can also eat this pan fried egg with boiled potatoes too as a weight loss meal too. And finally, if you want to lose between 20kg – 30kg before the end of this year, drop 2-3 dress sizes and become slimmer with an amazing toned body, then I want you to sign up for my 90 Day Fat Loss Coaching by clicking here. Thanks for reading. Do have a lovely day.